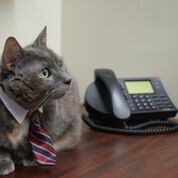 HSC Working Cats is a program to help cats not suited to indoor life find “employment” and new homes. Some Community Cats cannot be returned to the outdoor environment they called home due to varying circumstances. To help these cats find a permanent home, we began to consider non-traditional adoptions. Working Cats are usually accustomed to an outdoor life and un-socialized to humans. They are not suited to be indoor pet companions. These cats are often called “stray” or “feral” and avoid the touch of human hands. They usually prefer minimal contact with humans and tend to have higher prey drives. These cats often hunt snakes, rats, or mice, making them an excellent form of natural rodent control. Every HSC Working Cat is spayed or neutered before they leave for their new home, so adopters need not fear endless litters of kittens. 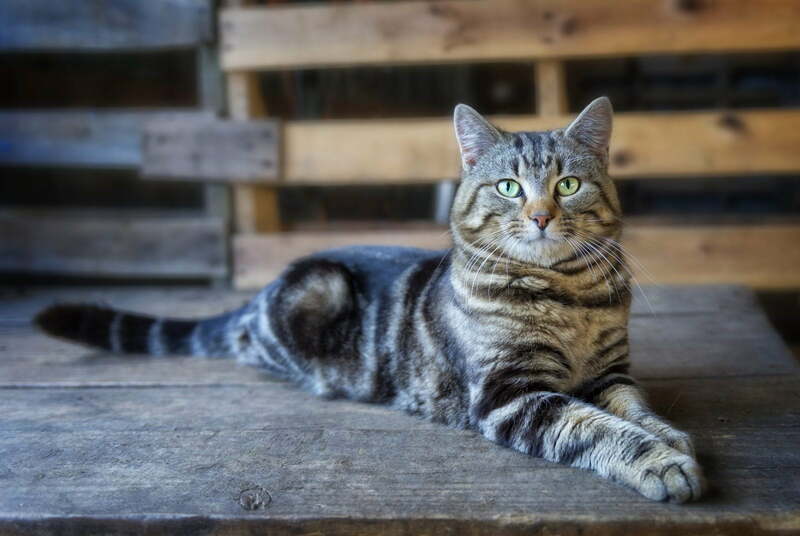 All Working Cats are vaccinated against rabies, microchipped, and in need of a new outdoor home. All Working Cat adoptions are free. The only cost to a caretaker is room and board: a small bowl of cat food and water set out daily and a dry place to stay out of the weather. 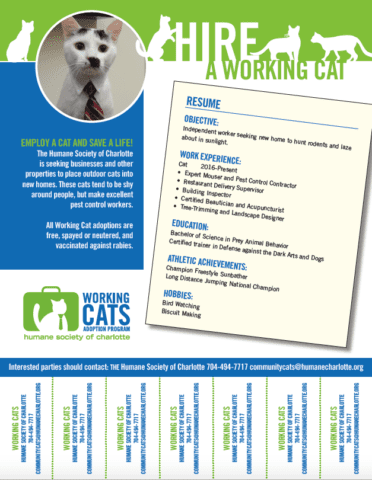 Working Cats are selected from eligible cats surrendered to Charlotte-Mecklenburg Animal Care and Control. Gender preferences we will be accommodated when available. Adopters will not be able to choose or visit with the cat prior to adoption. Cats can be rather contrary and sometimes don’t make the most efficient employees. We cannot guarantee that your new “employee” won’t sleep on the job or decide to live with your neighbor instead of keeping your business, warehouse, or garden free of vermin. Because of this, there are no adoption fees for those hiring a Working Cat. The employing adopter will be responsible for any veterinary care and food costs during the cat’s life, but there is no cost for adoption.